This past summer I discovered RumbaTime, a brand of fun, affordable watches and accessories. One of my favourites, is their Orchard Gem Collection of watches, which retail for around $45.00 US each, and can be purchased online or at Indigo in Canada. These watches are perfect for wearing alone, or layering with other bracelets (hello, arm party!). The band is silicon and is adjustable (one-size-fits-all), and the rose gold face is 35mm wide, and is water resistant up to 99 feet. These watches are the perfect combination of functionality and fashion. I actually first discovered RumbaTime watches at American Eagle Outfitters (RumbaTime did a line of watches exclusively for AE). Love at first sight, I purchased three of them in the Orchard Gem style: 2 for me, and 1 to give away. 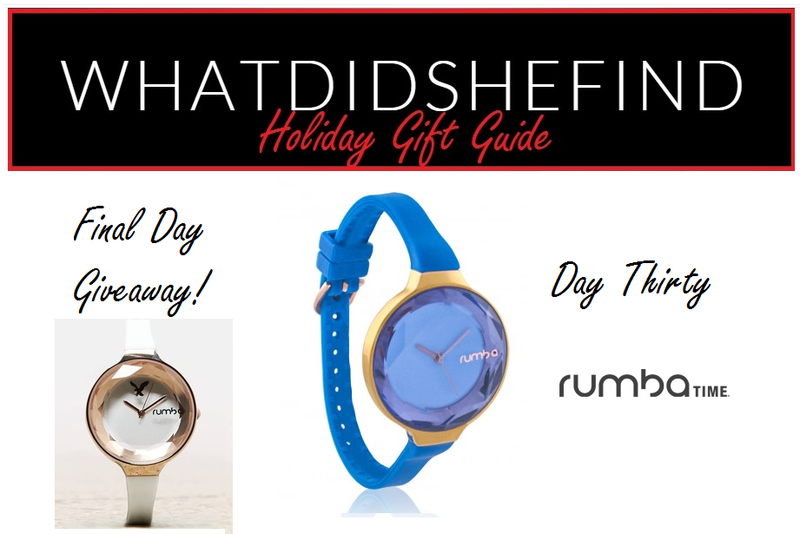 So, as a thank-you to all of you who have taken the time to read my Gift Guide entries over the last 30 days, I’m giving away the limited edition RumbaTime for American Eagle Outfitters watch shown above (on the left). To enter, all you need to do is follow this blog: WhatDidSheFind (you can find the “subscribe” button on the right-hand side of the page on a desktop computer, or at the bottom on a mobile device), and comment below letting me know what day of the gift guide was your favourite. The giveaway will close on Monday, December 22nd at 8:00pm, and is open to residents of Canada and the United States. I hope you enjoyed this year’s gift guide, and maybe even used some of ideas for your friends and loved ones. Wishing you a very happy holiday! Can I choose two days? haha. to be honest days 2 and 15. I literally bought so many people the Starbucks “dot” collection mug for their Christmas gift..they are super cute and convenient! for myself, I am hoping for a kate spade planner. I’m in love with anything kate spade so why not add some of that fun while at work? 🙂 thanks for this opportunity – have loved following all of these days and this watch is beautiful – may have to pick myself up one even if I don’t win! It’s hard to pick just one day, but my favorite was day eighteen!